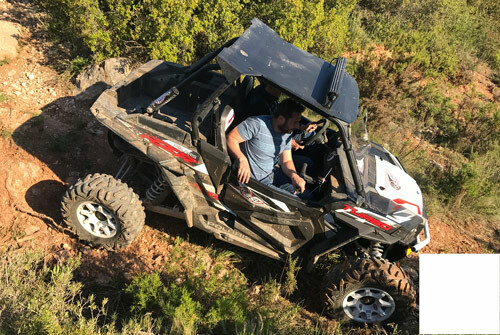 Incentive en Provence : Rallye tout terrain en RZR ! Looking for a memorable incentive activity in Provence? Our 4x4 Buggy excursion will definitely meet your expectations combining off-road driving experience and touristic tour. The best of Provence and off-road driving in one activity! Our incentive All Terrain Buggy Excursion is a surprising and original way to explore the region, to enjoy historic and natural sites while riding amazing unusual machines. The focus is made on conviviality, good fun and team spirit – sharing the wheel in turns so everybody get a chance to live the experience fully. This is an activity and daily program that marks a real break within the working routine. Incentive Buggy: and unforgettable day out! Starting from a private Domaine – that could be exclusive to your Group on request – the Instructors give an extensive safety & driving brief before hitting the road with all vehicules as a convoy. The itinerary is a mix of standard asphalt roads and dirt trails with a few technical passages or obstacle crossing (approx. 70% off-road). You’ll be amazed to find out how easy those Buggys are to steer and maneuver! For many people it is the opportunity to push their limits and improve their self-confidence. RZR models are designed to easy & fun use by non-professional drivers. Side-by-side vehicles get and impressive success in all amateurs’ opinion, especially the SSV Polaris RZR 800. 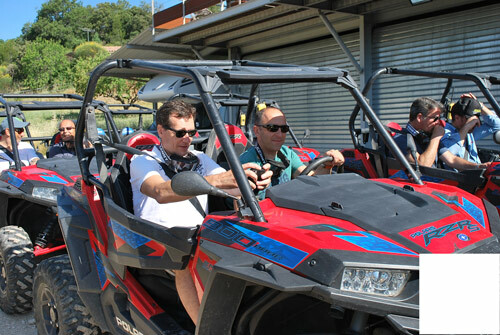 This type of Buggy let driver and passenger free to share impressions, talk together, act as pilot/co-pilot buddy team. This configuration is very much appreciated. According to your selected departure site, you’ll enjoy BBQ Lunch & chill by the pool after the excursion: a dream day out in Provence to look forward! Activ Provence is a licensed event & travel agency based near by Marseilles. Contact Activ Provence to organise your Company anniversary celebration party, your Winter business seminar in the mountains or Summer Board meeting on the Mediterranean Sea. Plan any Group outing with a team of professionals in the South of France.